Animated Film Reviews: "Bears on Stairs" - A Bear. On Stairs. We are going behind the scenes here a bit. This video shows how animation is created. It's not meant for everybody, but fellow geeks will get a lot out of this. This is a different kind of animation. It is not just pixels on a screen, it is a mixture of reality and fantasy. It may not look very impressive at first glance, but it is, in the immortal words of Monty Python, something completely different. "Bears on Stairs" is not meant to be a story, just a demonstration of the possibilities of animation. Anybody who has been at the cutting edge of technology will recognize what is going on with this demonstration. It is not an end product, but a step in a process of creation, a refinement of a technique. If you get into it, it is almost hypnotic. London-based DBLG has been working with stop-motion animation and combining it with modern 3D techniques. Their work has a unique feel to it. If you think this was easy to do - you're mistaken. 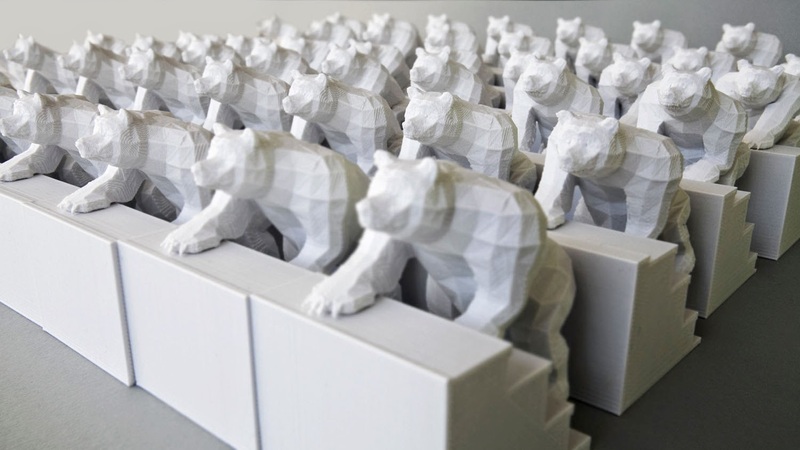 They worked up 50 or so little sculptures of bears and then spent weeks photographing them. This may look simple, but it is only possible because of advanced 3D printing techniques. You can imagine how much organization a project like that requires. This is cutting edge and eventually will make it into the films you see in the theater and other, real world, applications. That is how much work it takes to produce something like Bears on Stairs. That gives an idea why a feature-length animation from a major studio takes years of frenetic activity by teams of people. "DBLG's in-house studio projects are a platform for us to experiment with creative ideas and above all have fun. For this project we wanted to explore and combine 3d animation, 3D printing with stop frame animation. Massive thanks for Blue Zoo for the character animation blue-zoo.co.uk and Resonate resonatemusic.co.uk for the audio mix and sound design."